* Modified the object drop check so that it's no longer possible to drop any object in the immediate vicinity of any other object. * Implemented collision routines. This means that, whenever I add a new building, it will be solid and it will no longer be possible to pass through it. Note that I will never implement collisions for the buildings of the new Birmingham Island, but this will not be a problem for Mercenary IV, because the new Birmingham Island will not be in Mercenary IV: the layout of the city will be coherent with Damocles and Mercenary III, not with the little we know of Damocles for PC. Right now, there are solid structures on Clotho. * Optimized the use of skyboxes, so that a new skybox replaces the old one instead of being added to it. This gets rid of a cumulative slowdown that used to happen every time a new skybox was created. * Fixed the escape function that I forgot to modify (oops!) in the previous release: now it uses the Irrlicht timer too and the ground escape speed is no longer out of control. * Fixed the bug of airplanes and spaceships gradually sinking into the ground if the mouse is moved down while taxiing. * Fixed the bug of keys not responding correctly if they are pressed while the mouse is being moved. * Started a gradual code reorganization, with the goal to turn the current style (imperative) to object oriented. The process will be long and the code for the next versions will be a hybrid between the two styles (hopefully, turning more and more to object oriented from one version to the next). * Upgraded to Irrlicht 1.7.3 (which, at the time of writing, is the latest version of Irrlicht). Now the code no longer supports older versions of Irrlicht. This should hopefully not impair compatibility with older computers, and also extend it to newer systems. This also solves a problem with the skybox in OpenGL mode. * Fixed a bug that caused text tools not to display their text when activated in space or on a planet that did not trigger one of Benson's descriptions. * Fixed a bug that caused the ground coordinates fields in the GUI not to rescale to higher resolutions. * Implemented a game clock based on the Irrlicht timer. The relativistic time effects of high speed space travel (the acceleration of the clock, of the planet rotations and of the movement of dawn and dusk lines) are now implemented too. * Modified the flight and object spin routines, so that they are based on the precise Irrlicht timer instead of the approximative FPS computation function. * Limited the explorable volume in space to a cube with the side of 14142134 units and added an appropriate Benson comment, in order to prevent players from straying too far from the sun, losing sight of it and being unable to return to any planet. * Highly reduced the problem of ground structures flickering when seen from great altitudes. * Fixed the bug of ground vehicles gradually changing their altitude if the mouse is moved up or down in driving mode. * Moved the the emergency escape routine call to another part of the program, so that it's called instead of the landing or crash routine if the player is on Dialis, Triton or Juno. * Added a check to prevent inventory objects from being dropped near heavy objects (like vehicles or transporters). This was also present in Damocles and Mercenary 3, to avoid being unable to pick up an object because the pickup routine checks the heavy object first. * Added the ability to shoot while using the wingpack, if the neutron blaster is in your inventory, because it's not a vehicle that encloses the pilot completely. * Added the streets of Clotho New Town, and the Lloyds Group 4 building at 01-00 Clotho. The building does not include collisions yet. * Implemented elevator routines. Right now, the only building with a functional elevator is the Lloyds Group 4 building. * Added a check in the LeaveVehicle function, to prevent the player from leaving a vehicle in space. * Added movement limitations in the escape routine, to prevent the player from changing flight direction when escape mode is active in space. * Implemented a scripted event for the plot I envisioned for Mercenary IV, based on a Mercenary IV dream by Simon Guyart. To trigger it, approach Marduk (the "unknown" reddish planet) as much as you can and see what happens. 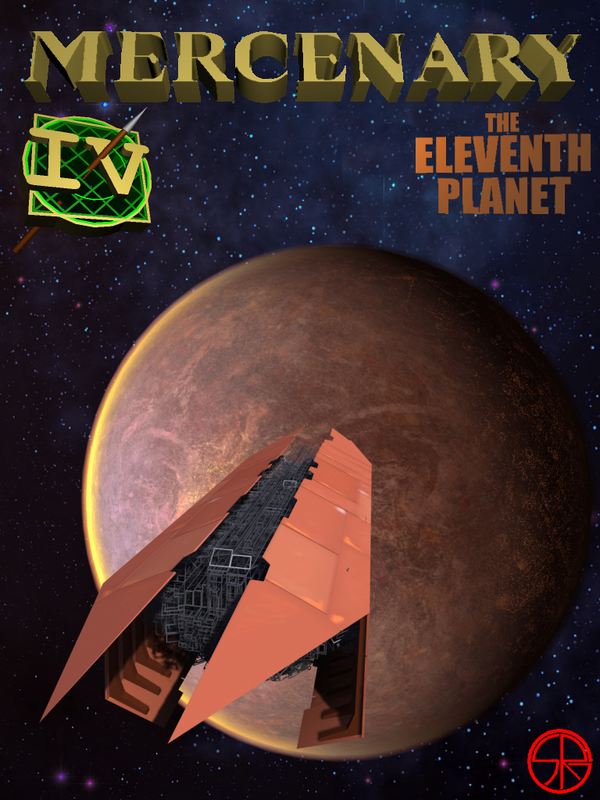 * Made a concept Mercenary IV boxart, based on the above mentioned scripted event. * Added a steady slow movement for Damocles: after all, Damocles is a comet, and by the time Mercenary IV happens, it has passed the perihelion, so it is supposed to move away from the sun. * Added the ability to shoot while on the hoverboard, if the neutron blaster is in your inventory (because in real life you can shoot while riding a skateboard, if you have a gun in your hands). * Added the BestCupand spacecraft. It's on Gaea, Chaldea Metropolis, near transporter #6. * Fixed a bug in the shooting routine that caused shots to stand still or move backward if shot when travelling at a high negative speed. * Replaced BMP files for Benson subtitles with PNG files. * Implemented the sights. They are on Eris, Bare Island, near transporter #1, and they work exactly in the same way as they did in Mercenary 1, 2 and 3. * Started the implementation of tools (objects that can be activated and used from the inventory). All tools that display text, as well as a tool that will be used in Mercenary IV, are implemented, but as of now, only the museum guide (on Cronus, near the beacon) is reachable for spoiler reasons. * Fixed a bug that used to occur if the safe quit option is used when the Dart IV is in the inventory (it used to remain in the inventory even after being transported to space, now it's correctly taken out). * Added the five green craters on Cyclopes. * Modified the vehicle-related functions so that they check for common vehicle attributes instead of checking vehicles one by one, to avoid modifying them every time I add a new vehicle. * Replaced the B and L keys to board and leave a vehicle with a single control (the right mouse button) for both actions. * Added the mining trenches on Lachesis, with five bulldozers. * Added the "Hades labour camp" on Pan (no buildings for now). * Added a new car: the Targ Tourer. It is located on Pan, near the red beacon. * Implemented the ability to shoot (by pressing the left mouse button) when on board of certain vehicles. Not all vehicles can shoot: this is intentional. * Implemented a hand weapon (called "neutron blaster") to be able to shoot while on foot. Note that the neutron blaster does not add the ability to shoot to the vehicles that lack it, just like, in real life, you cannot turn a commercial plane into a fighter plane by shooting a gun inside it. The neutron blaster is on Bacchus, near transporter #8. * Simplified the visibility check for ground structures. This also fixed a bug I had introduced in the previous version (whoops!) where the volcano and the radio towers remained visible in space. * Simplified the functions to board and leave a vehicle. * Optimized the functions that manipulate the GUI so that they just change the images of existing elements instead of adding new elements on top of the older ones. * Removed quasi-duplicated code (for the number and function keys) from the keyboard routine. * Optimized and debugged the function that converts the speed from space to ground and viceversa. * Implemented two vehicles never seen before in any Mercenary game: a hoverboard and a wingpack (they are actually a keyless car and plane that can be picked up without the antigrav; the hoverboard runs at a fixed speed). The hoverboard (my take on the skateboard that was rumored to be present in Damocles) is on Dion near the starting point; the wingpack is on Vesta near transporter #4. * Implemented a keyless spacecraft: the Dart IV. This is normally located on Mentor near transporter #9, unless the quit function (see below) is used. * Implemented a quit function that works like in Damocles (except you have to press Pause instead of Help and F12 instead of F10). When you quit, you find yourself in space near Icarus, aboard the Dart IV. If you are aboard another vehicle when you quit, that vehicle becomes unreachable. * Added the entire museum on Cronus, with the classic objects seen in Damocles and Mercenary 3, plus new objects referring to events that occurred in those two games. * Added a functional ground coordinate display to the HUD. * Implemented beacons (on the same planets and at the same coordinates as in Damocles) and beacon locators (on Logos, near transporter #7). * Changed the movement keys: now you move around with WASD. * Implemented transporters. To use: enter a transporter, type a digit and exit the transporter. * Implemented the void (no buildings for now). * Implemented a 20-item inventory without the need of a briefcase. Use cursor up to pick up an object; cursor down to drop it; cursor left and right to scroll the inventory. * Implemented the antigrav (pick it up in order to be able to pick up objects that are "too heavy"). * Implemented vehicle keys for the Eagle 9 SE, the VIP limo and the Concord III. * Added the Vulcan Island volcano on Gaea. * Added five radio towers on Theon, around coordinates 0,0,0. * Simplified the movement of the means of transport so that it refers directly to the camera coordinates. * Replaced the old VIP limo model with one more detailed. * Fixed a bug in the flight routine for the plane. * Added detail to the Concord III model and texture. * Implemented a plane (a flying vehicle not equipped for space travel). The plane is on the small island just west of Dion North (was that island supposed to have a name in Damocles for PC?) and is two times slower than the spaceship. * Fixed the keyboard routine so that the functions are only executed when a key changes status from "not pressed" to "pressed", instead of being repeatedly executed the whole time a key remains pressed. * Modified the sky textures for Dialis, to make its skybox look more like the surface of a white star than a sea of frozen milk. * Modified the flight function, so that the speed varies in function of the height when flying over the surface of a planet. * Changed the diffuse color for all objects to white (it was gray in the previous builds) and modified the skyboxes accordingly, to obtain a much closer look to that of Damocles for PC. 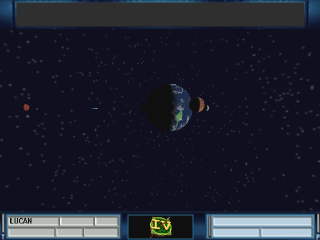 * Implemented day/night cycles for planet surfaces. * Aligned the coordinate system of Gaea and Eris to those of the other planets (to simplify the implementation of day/night cycles). * Added alternative code to be able to compile the source with the latest version of Irrlicht. * Now the default renderer is OpenGL, so Linux users won't be forced to run the Config utility (unless they want to increase the resolution). However, all renderers are still available, so, if you want to run it in stereoscopy, you just have to select Direct3D 9 from the Config utility (and have stereoscopic hardware and drivers, of course). * Added functional temperature and pressure gauges. * Added some nicks and scratches to the Eagle 9 SE texture, so that it doesn't look like it's made of wood. * Added a gear screech sound when a plane or spaceship lands. * Added a car sound that plays when you drive a car. * Recalibrated the car speed (now it's four times slower than the spaceship). * Added some pyramids on Midas, as an experiment for the "wraparound" routine for that planet. * Replaced the multiple executables with a single program executable, a configuration file and a configuration utility. * Changed the sky color for Dion and Vesta, to make it coherent to what we see in Damocles and Mercenary 3, but more realistic. * Modified the texture for the Eagle 9 SE to make it more detailed. * Modified the lower part of the HUD, to make it look like an evolution of the HUDs from Damocles and Mercenary 3. Every section of it, even though nonfunctional in this build, has been assigned a future purpose. Yes, the Roman number on the Mercenary symbol in the center is a 4: if you like, you can consider TADPSID as an early alpha of Mercenary IV. * Added the whole space part, including Marduk and its moons from my vision of Mercenary IV. Now it is possible to fly from a planet to another, with the exception of Marduk (you just pass through it, because I don't want to reveal yet what is on the ground of Marduk). 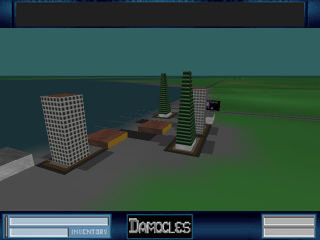 Note that I did not add any building to those that were already present in version 1. * Now the "closest planet" part of the HUD is functional. Note that if you approach Marduk or its moons, the HUD says "UNKNOWN". This is intentional, and in my vision of Mercenary IV, that is what happens when you approach Marduk for the first time. * Added Benson speech (yes, Benson speaks) and subtitles, with a description for each of the planets including Dialis, Eris and Damocles. Again, this excludes Marduk and its moons for spoiler reasons. * Removed the instant transport keys (they are useless now that you can fly from one planet to another) and the numeric keypad controls (they were redundant and only inserted in the first version to imitate the control system of the original Damocles). * Updated the TADPSID license to a precise document written in "legalese", based on the Apache v2.0 and MAME licenses. * This is the first release. It allows you to walk, drive and fly around three virtual environments (Dion, Eris and Vesta) that resemble what is known of Damocles for PC. You can transfer from one environment to another by pressing Z, X or C.
Damocles is a game that came out in 1990, for Amiga and Atari ST, that allowed the player to explore a whole solar system, on foot and with various vehicles. A remake for MS-DOS was supposed to come out in 1995, with textured graphics, an orchestral CD soundtrack and (if used with a VFX-1 head-mounted display) a stereoscopic display mode. Unfortunately, Psygnosis cancelled it mere weeks before its release, and despite unsubstantiated rumors of a demo based on Mercenary 3 being released, it never saw the light of day. And this is where TADPSID comes in. Like Bobby Brown says: "If you want something done, you gotta do it yourself.". So, with the released screenshots as a reference, I started modelling objects and making textures to populate a virtual environment that I created with Irrlicht version 1.5 and Irrklang, with the goal to recreate as closely as possible the look that Damocles for PC was supposed to have. How close? Well, take a look at this sequence of comparative screenshots and decide for yourselves. On the left, you can see the original Damocles screenshots. On the right, you can see what that environment looks like in TADPSID. TADPSID renders its graphics with Direct3D 9, which makes it compatible with all modern forms of stereoscopy, from the eDimensional glasses, to the nVidia 3DVision kit, to head-mounted displays like the VR920 or the Z800. TADPSID is open source, but NOT under the GPL or any other pre-existing license. Read the custom TADPSID license. Really, I just wanted to have a bit of fun. The person talking in the video was me. As you now understand, "if I told you how I got this" (I made it) "it'd be obvious who I am" (I'm the one who got the idea of Mercenary IV in 1998, made the Gamma System Explorer in 2000, tried to make Mercenary IV in Dark Basic in 2004 and made a Gamma System addon for Celestia in 2010, so it would've been pretty obvious that I made this Damocles-related work too). Also, I was "whispering so I wouldn't be identified" because I have Youtube videos where you hear my voice, which would have been recognized, ruining my little joke. The DOS program I used in the video was a hacked version of Dave's Flic Viewer, executed through a batch file called DAMOCLES.BAT that recalled a 16-frame looping animation made only out of black frames. What you did not see in the video (I cut that part out) was how I minimized DOSBox, closed it and ran TADPSID. You also missed the fake Psygnosis disclaimer that I made DFV display at the end by editing the executable with a hex-editor (I decided not to show it soon after making it, because I thought it would be a clue in discovering the joke).